This product requires the base game Tropico 4. Poor healthcare is responsible for the death of the last remaining voodoo priest on Tropico. A new threat rises when the evil sorceress Vanya arrives from Soviet Russia to curse El Presidente and his regime. 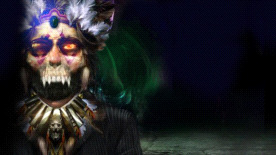 Study the mystical ways of voodoo and use them to your benefit with the new Voodoo Manor tourist attraction, impress your people by wearing a fancy Witch Doctor costume combined with a new voodoo trait enabling your people to survive even with the poorest of healthcare. New mission: The Big Voodoo Shuffle – Create an El Presidente voodoo doll to contain the curse! Tropico 4 is required to play this DLC.